Particularly with the rise in the use of digital records, scribes have been increasingly seen as a solution to improving physician productivity. Only one survey study has looked at ED physician preferences, and this was in an academic centre in the USA. We instituted a scribe programme in an Australian ED where consultants deliver care directly and interviewed those who used and did not use a scribe. Most physicians liked working with a scribe, finding it improved productivity, improved communications with patients and decreased stress. Those consultants who did not wish to use scribes felt that scribe notes missed nuance and readability, preferred writing their own notes as a way of organising their thinking and plan and felt that scribes negatively impacted on the patient–physician relationship. Emergency consultants perform a significant number of clerical tasks in the provision of direct patient care, taking up to 43%1 2 of the doctors’ time. This is increasing with the transition to digital data records. Medical scribes may or may not provide cost-effective assistance with this.3–11 While productivity gains are worthy of pursuit, the major day-to-day impact of the scribe will be on the doctor. The experience of working with medical scribes was previously described by primary care physicians in the USA, highlighting concerns about the accuracy and detail of scribed notes as well as the importance of the relationship between scribe and physician.12 In comparison to primary care physicians, however, emergency consultants often manage multiple and more acute patients simultaneously in longer, but one-off encounters that are often interrupted and necessitate shifting in and out of different patient’s charts. Emergency consultants are continually required to adapt their work styles to optimise resource utilisation for their patients.13–16 Their experience adapting to work with scribes is not yet broadly described; however, Hess,10 in a single centre USA survey, notes that 60% of ED providers liked or really liked having a scribe, 74% had an overall positive attitude towards the scribe intervention, whereas 9% would be happier without one. Scribe implementation should not be undertaken without an attempt to understand the impact on consultants who work with them and the reasons some consultants decline to work with a scribe.17 This might guide policies on scribe programme development, scribe recruitment and the allocation of a scribe to a consultant. The current qualitative study aimed to describe the experience of Australian emergency consultants working with scribes and the reasons some consultants elected to not work with a scribe. This was a prospective, qualitative study conducted as part of a scribe economics study (ACTRN12615000607572), investigating the experiences of consultants during implementation of a scribe programme. The programme was initiated in January 2016. Individual, semistructured interviews were conducted in October 2016. The study was undertaken at Cabrini Emergency Department. It is a tertiary, not-for-profit, Catholic private hospital in the southeast of Melbourne, Australia. The network (five campuses and one ED) has 832 beds; the ED has 24 000 annual visits (adult and paediatric). The average patient age is 56 years; the admission rate is 50%. Consultants provide direct patient care with limited supervisory or flow responsibilities. The consultants take histories and examine patients, arrange all tests, obtain previous test results from external facilities, liaise with health workers and families, locate specialists, complete medication charts, book beds and appointments and complete free-text electronic medical record (EMR) documentation. Until the scribe programme, the consultants had no assistants. The average patients per-hour per-consultant is 0.83,11 which is typical of EDs serving complex, older patients in Australia with high admission rates. Consultants eligible to receive scribes as part of the economic study were eligible to participate in interviews. They were permanent staff, working at least one shift per week at Cabrini. They were all offered training in how to use a scribe. The primary investigator of the economic study (KJW) was excluded from interviews. Consultants were approached face to face and informed that the ED scribe research group was investigating consultant views on the scribe programme. They were invited to participate in a 20 min voluntary interview containing a combination of structured and semistructured questions and were informed that responses would be anonymous. Interview questions(see online supplementary A) were designed by the author group to explore consultant perspectives on how working with scribes might affect stress, efficiency and safety. The interview was not piloted. A senior medical student (AT) who is independent of the scribe programme conducted interviews with consultants who participated in the scribe programme. These interviews were recorded and transcribed by a secure, independent transcription service. The interviewer for consultants who declined to work with a scribe was a medical student (TLC) and Cabrini scribe, who has previously undertaken qualitative research. Responses were recorded and transcribed within 24 hours by TLC. Responses were not reviewed by the participants for completeness. There were no repeat interviews, and participants were not informed of the findings from the interview phases. Interviews were analysed using a combination of deductive and inductive methodology. Responses to each question provided deductive results for those specific questions. In addition, inductive methods were used to derive subthemes that incorporated answers from each interview. Subthemes were derived independently from the transcripts using thematic analysis by TLC, KJW, WD and AT. TLC and WD are Cabrini scribes, KJW is the scribe programme director and AT has no relationship with the scribe programme. These researchers all had training in qualitative research, all but AT has prior experience. The researchers used open and axial coding of interview transcripts to extract themes. All phrases were sorted into themes. Quotations were selected that best identified positive and negative responses to each theme. No coding software was used for data analysis. The study was approved by Cabrini Human Research Ethics Committee (06-21-03-16), prospectively registered (ACTRN12616000202460), and written informed consent was obtained from participants. Sixteen consultants were eligible for inclusion in the economic scribe trial (figure 1). Two declined to work with scribes but agreed to be interviewed. Three consultants who worked with scribes were unable to be interviewed because they had ceased employment with Cabrini. Interviewed consultants were predominantly men (71%), and ages ranged from 39 to 55 years. Self-reported participant characteristics are recorded in table 1. Consort flow chart for participant flow through study. For consultants who worked with scribes, theme saturation was achieved by the sixth consultant interview. Seven themes were identified, and interview responses for major identified themes have been summarised into quotation tables with interviewees recorded as ‘C.x’ for consultants who worked with scribes, and ‘D.x’ for consultants who declined to work with scribes (tables 2–4). Both consultants who did not work with scribes agreed to be interviewed. 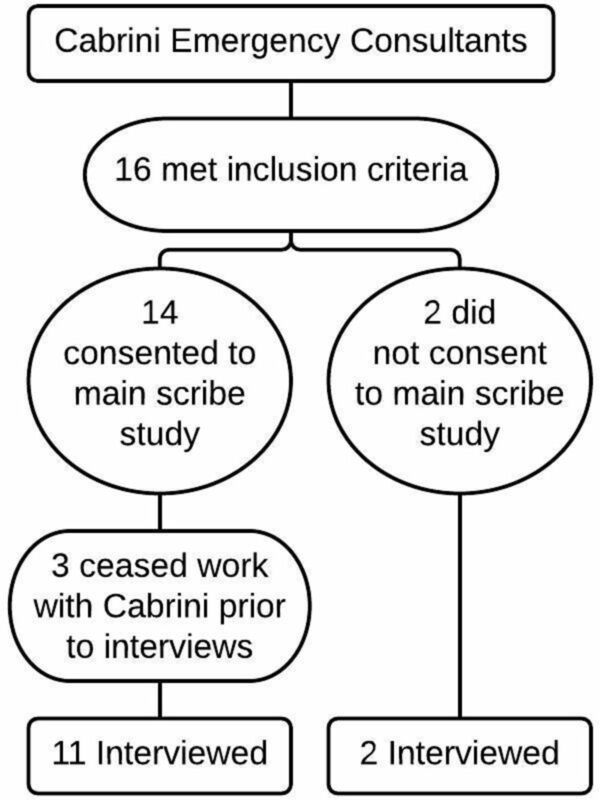 One of the interviewed consultants who declined participation in the main scribe trial had previously used a medical scribe in the pilot study; the other had extensively reviewed ED scribed notes but had not worked with a scribe. Both were experienced consultants. There were not enough participants to ensure theme saturation. Their comments contributed to themes 1 (role of scribes), 3 (impact on consultant work ability) and 5 (impact on patient–physician relationship). Consultants who chose to work with scribes discussed the difference between physician and scribe capture and interpretation of consultations. In some areas, more detail was captured, in others less. The main areas for consultant editing were where medical synthesis was required. They valued capture of details when seeing complex patients (table 2). Neither consultant who declined to work with a scribe was concerned about the accuracy of scribed medical notes; however, they were concerned about the nuance and ‘readability’, especially in the setting of sending correspondence to other medical practitioners. doctors put a paragraph in at the end that ties it all together. Consultants described real-time capture of patient history and examination. They also used scribes to seek collateral information about previous patient care. They valued in-room ordering of beds and investigations, allowing them to move between patients without needing to find a computer desk to type notes and order investigations. They found scribes most useful at the beginning and end of patient processing and less useful during results review and specialist consultations (table 2). Those using scribes found the quality of the scribes’ work generally improved with time. One consultant who reported an inaccuracy in the medical record (identified in retrospect) could not recall the nature of the error that was noticed and noted improvement since the implementation phase of the scribe programme. Scribe limitations in information synthesis and inability to prescribe were mentioned. Consultants valued scribes who were proactive and anticipated their next tasks. Consultants using scribes reported that they allowed the physicians to feel more productive and spend less time using computers. They valued the in-room capture of information by the scribe and felt that this allowed them to focus on patient assessments and their clinical role, rather than documentation (table 3). Doctors using scribes reported that they were less stressed and less tired at the end of shifts. They felt better able to manage several patients and to see several complex patients. At times, however, scribes pressured them to take on more than they had capacity to manage (table 3). Notably, both doctors using scribes and those declining them felt there was something to be gained in writing in their own notes. Doctors using scribes reported that they felt that writing their own notes better allowed them to synthesise information. Like the consultants using scribes, consultants without scribes reported concerns about the loss of the thinking time to process the information in the case that they usually have while writing notes. Many consultants working with scribes reported a reduction in stress levels and exhaustion. Shifts were more enjoyable, and doctors left work on time (table 4). Both consultants using scribes and those who declined scribes agreed that the use of the scribe changed the patient–physician relationship and communication style. Those using scribes had to learn to tell patients in the room of the exam findings and their plans. They reported going on to use this style even without a scribe present. One consultant noted that they spent less time answering patient questions when with a scribe. This consultant suggested that their clinical impression and management plan were articulated more when a scribe was in the room so the patient had fewer questions. They were also concerned about the logistics of scribes in terms of space on the department floor and in small patient cubicles. Consultants reported maximal productivity and enjoyment when working with a scribe with whom they had a good relationship owing to the ease of communication. The personalities of the consultants and scribes appeared important. Several consultants noted scribe–doctor working relationships improved with time together. The main reason reported by the two consultants who opted to not work with a medical scribe was a preference to work independently. followed by the consultant’s use of the same scribe to foster an optimal and efficient working relationship or to select which scribe they worked with. a scribe could be shared between clinicians (C.1). Interviewed consultants who worked with scribes (11/16) described themes of contentment with scribed notes and value gained from the scribe role. They edited mainly for medical synthesis of information, which was the main concern regarding notes of consultants who declined to work with scribes (2/16). Consultants in both groups agreed that writing their own notes allowed them time to think about presentations and synthesise information. Consultants who declined to work with scribes preferred their own nuanced notes and this thinking time. Yan et al identified a similar concern held by consultants regarding having control over their notes.12 Consultants who worked with scribes, however, reported improved productivity, workplace satisfaction and ability to meet key (time) performance indicators. They reported less workplace stress and exhaustion and less need to stay behind after their shift to complete notes. Suggestions for future scribe programme indicated a preference to work with one scribe for a consistent working relationship. All consultants currently working with scribes would prefer to have a scribe with them every shift. This was a small single-centre pilot evaluation in Australia using small cohorts of scribes and consultants in a private tertiary ED. Scribes were relatively junior, and consultants had relatively little exposure to scribes. The study interviewed consultants who were relatively inexperienced in working with scribes. Owing to scribe availability being mainly limited to evenings and weekends, consultants who worked weekends gained more exposure to scribes. Further work should include multiple settings and greater numbers of consultants, exploring themes identified in this pilot. The study was susceptible to sponsor, social desirability and confirmation biases (investigators worked at the study site and were involved in the scribe programme). Owing to logistical restrictions, the primary author conducted interviews with consultants who did not work with scribes while an independent author interviewed the participating consultants. This may have introduced author bias. These limitations could bias the study in favour of scribes. All consultants who had used medical scribes valued them and preferred to work with a scribe in the future. Consultants felt less stressed and felt a reduction in cognitive loading when they worked with a scribe. They felt more able to multitask when a scribe was present. Consultants suggested that working with the same scribe every shift and the development of rapport between consultant and scribe would be valuable. Consultants who did not want to work with a scribe preferred to work independently, were concerned with the loss of nuance in the notes and the synthesising they undertook while writing their own notes. We thank our ED consultants, staff and scribes.
. Emergency department physicians spend only 25% of their working time on direct patient care. Dan Med J 2013;60:A4558.
. Short-stay units and observation medicine: a systematic review. Med J Aust 2003;178:559–63.